The Historic towns tour shows you the major Dutch highlights, the perfect ride for a first time cycling holiday in the Netherlands. Haarlem, Leiden, The Hague, Delft, Gouda and Utrecht are amongst the most famous and favourite cities of Holland/the Netherlands. This unique trip combines these vibrant towns together with the beautiful rural countryside. Enjoy the quiet coastal bike lane through rolling sand dunes, the Kinderdijk windmills, the canals and lakes near Gouda. In springtime visit the famous tulip fields and the Keukenhof! Your tour starts with a personal bike fitting and a thorough explanation of your tour in Haarlem. 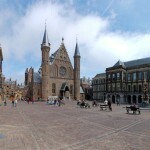 Pedal to the historic town centre at the main square near the Sint-Bavo church. 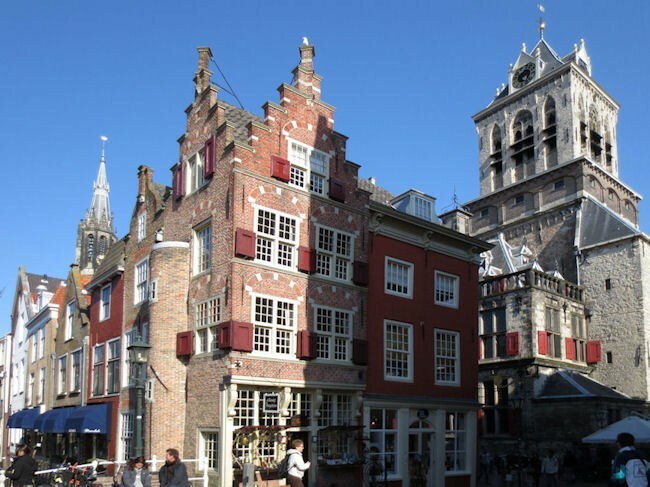 This is the right spot to start exploring the town, the hidden ‘hofjes’ (squares with tiny houses), The Frans Hals museum, the Teyler museum or the Corrie ten Boom house. 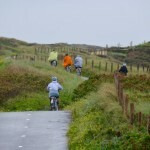 Afterwards you are biking through lovely forest areas to the coastal city of Zandvoort. Have a coffee or lunch break before heading south along the quiet coastal bike lane. Enjoy the coastal scenery, the sand dunes and maybe in summertime have a swim at the beach. In spring time (beginning of April to mid-May) the route goes by the flower district. 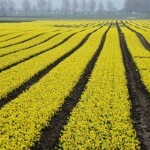 The flower fields are one of the major highlights in the Netherlands. 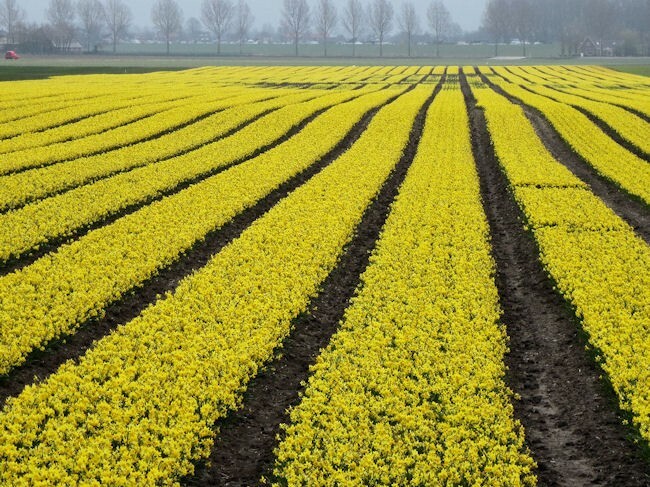 Tulips, daffodils and hyacinths transform the landscape into a coloured carpet. The Keukenhof flower garden is of course on your route and is a must to visit. The final destination is the beautiful historic town of Leiden, the oldest Dutch university town. 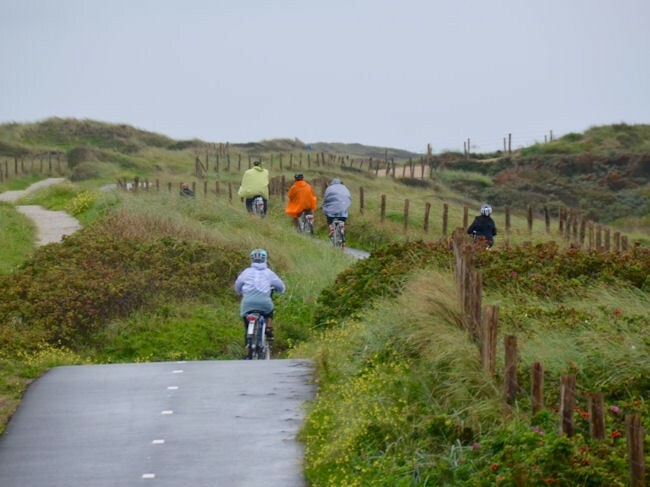 If you should join this tour from the second half of May untill the end of the holiday season the route runs along the coastal bike lane up to the quaint coastal village of Noordwijk and finally up to the city of Leiden. After breakfast you are biking by the historic town. So if you haven’t been able to stroll around the town during your first evening, don’t worry as you will pass by all the highlights , including the Burcht van Leiden (a medieval fortification), the Botanical garden, the impressive city canal ‘Rapenburg’ and the windmill museum de Valk. In Katwijk aan Zee you will encounter the North Sea once again. Enjoy the coastal bike lane heading south and pass the lovely green forest areas near Wassenaar where parts of the Atlantic coastal defence wall were built by Nazi Germany. Just before the Hague we give you the option to ride by the impressive governmental town or to skip it and to ride on just passing the Hague through a mixt of forest areas and lowlands. In the Hague you will pass of course the governmental palace, or you could even bike through it! Pass the Mauritshuis museum, the Peace Palace, the Panorama Mesdag and Escher museum. The final part of the ride of this second day will be along a lovely canal up to the famous historic town of Delft. 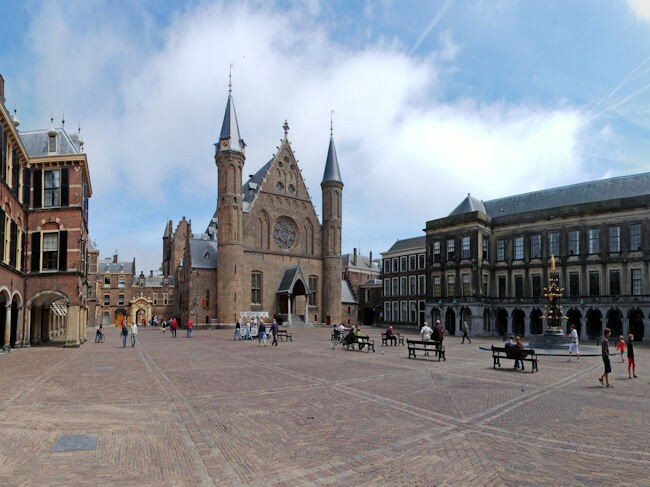 The city of Delft retains a large number of monumental buildings built along the city canals, and is well known for both the Delft pottery ceramic products and the famous painter Vermeer. 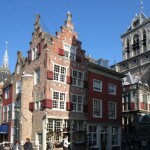 The Delft area is famous for its horticulture in greenhouses, growing flowers and vegetables. Leaving the town of Delft through a lovely park, reach the greenhouses near Pijnacker and Bleiswijk, an interesting area with a mixture of typical Dutch lowlands and greenhouses. From Bleiswijk the landscape will change and you will leave the agricultural area, entering the ‘green heart‘ of Holland passing the Rotte river which is a lovely recreational area for the inhabitants of the town of Rotterdam with perfect bicycle lanes along the river and some lovely historic windmills to enjoy. The final part of today’s ride will be by the lovely villages of Zevenhuizen and Moordrecht, finishing your day’s journey at the famous cheese town of Gouda. If you are able, try to visit the traditional Thursday morning cheese market at the start of Day 4. This will be your final visit of the town so don’t forget to buy some typical syrup waffles for breakfast before leaving. These waffles are very delicious and will give you plenty of energy for today’s ride! The ride from Gouda to Schoonhoven is through the typical Dutch landscape caught by so many famous painters. Bike lanes head along canals, lakes, the Rhine river and picturesque farms showing you bird life, cows and horses. 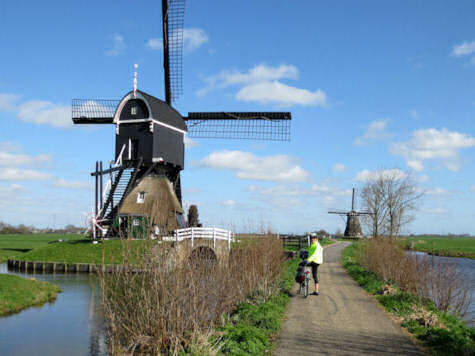 The major attraction of the ride will of course be the UNESCO monument of the Kinderdijk windmill group. The windmills at Kinderdijk are a group of 19 monumental windmills built between 1738 and 1740, to keep water out of the polder. It is the largest concentration of old windmills in the Netherlands and one of the best-known Dutch tourist sites. The second part of the trip will be by the Rhine valley and up to the historic silver town of Schoonhoven. Since the 17th century, silver and goldsmiths have been working here and today Schoonhoven hosts the Dutch silver museum. The hotel is situated on the banks of the Rhine river, its terrace giving you a great view of the inland cruise ships stopping for a visit. The final day adds yet another great memory to your bike tour. By leaving Schoonhoven you will ride along the picturesque river Vlist, a beloved stretch among cyclists and pedestrians, who enjoy walking or riding along it. The river itself is often navigated with canoes and if the river is sufficiently frozen in winter skating tours are organized for the ice enthusiasts. The ‘Heksenwaag’ (Witches Scales) is a famous highlight in the old centre of Oudewater. In the 16th century people accused of witchcraft all over Europe were allowed to prove their innocence in Oudewater and avoid being burned at the stake. After the weighing in they received an official certificate proclaiming that they were not witches! Even today you can get this certificate. The final destination of your ride today is the town of Utrecht which features many buildings and structures dating back to the Middle Ages. It has been the main religious centre of the Netherlands since the 8th century and until the Dutch Golden Age, was the most important city in Holland. In Utrecht your tour will stop and you will meet a Tulip Cycling representative once again. The train station of Utrecht has perfect connections to all parts of the country or to the airport.